Here’s a great Christmas gift for someone who already has a iPod Nano. 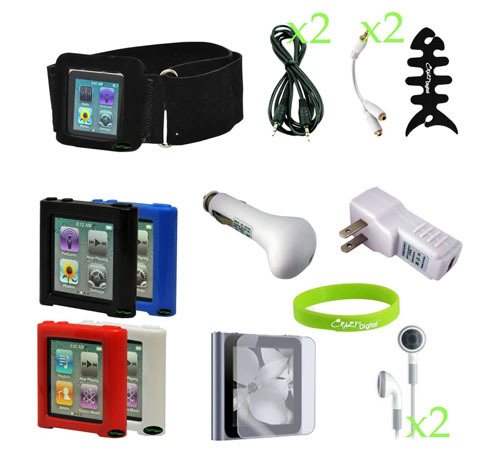 CrazyOnDigital Full Accessory Kit For iPod Nano 6G (newest model) has all the essential accessories. The kit includes a sporty armband, 4 skin case cover protections, USB car auto DC charger, USB travel home AC charger, 2 stereo headphones, 2 headphone splitter, 2 auxiliary cable, 2 full body screen protectors and a fishbone headphone winder. The whole kit is now only $29.99 (original price $ 49.99).